Quebec: Festival Acadien supports CODOFIL’s Lâche Pas! Festival Acadien supports CODOFIL’s Lâche Pas! 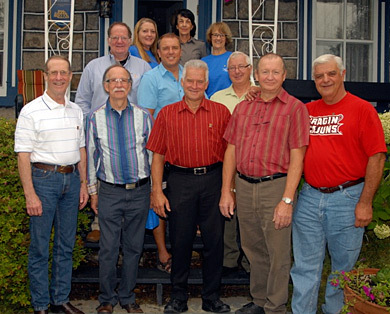 Front row: Warren A. Perrin, Chairman of the Acadian Museum and CODOFIL Board Member, René Gareau, city councillor of Sainte-Marie-Salomé, Robert Perreault, mayor of Saint-Alexis paroisse, Pierre Beaulieu, mayor of Saint-Jacques de Montcalm, Kermit Bouillon, Lafayette Parish School Board member for District 5. Second row: Chef Pat Mould (who prepared a Cajun meal for one festival event on August 8), Stéphane Malenfant, director of Les fêtes gourmandes de Lanaudière, Serge Rivest, mayor of Saint-Liguori . Back row: Vera Petley, from Montreal, Annette Coutu, president of Conseil de développement bioalimentaire de Lanaudière, and Évangéline Richard, president of Festival acadien de la Nouvelle-Acadie. On August 7, 2012, for the first time, a Louisiana delegation attended the Festival Acadien in Nouvelle Acadie, a region composed of four municipalities in Northern Quebec: Saint Alexis, Saint-Jacques, Saint-Liguori, Sainte-Marie-Salomé. Attending the event at the invitation of the President of the festival, Evangeline Richard, were Warren A. Perrin, member of CODOFIL and Chairman of the Board of Directors of the Acadian Museum of Erath, Kermit Bouillion, member of the Lafayette Parish School Board representing District 5 and Chef Pat Mould, Chef Owner of Louisiana Culinary Enterprises, who prepared an authentic Cajun meal for over 200 people at the Golf Club Montcalm in Saint-Liguori. As part of the Fais-Do-Do celebration, a raffle was held and $1,000 raised and donated to CODOFIL to aid in restoring funds lost when Gov. Jindal vetoed the appropriation of $100,000. The Louisiana delegation was taken for a tour of the Acadian region known as Lanaudière which has developed, with help of the Quebec government, a unique system of eco-tourism based upon the preparation and serving of locally grown fruits, vegetables and meats. Bouillion spoke to representatives on the present state of French language education in Louisiana in general, and the French Immersion programs in particular. Perrin, author of Une Saga Acadienne, made a presentation on his book which is a biography on Joseph Beausoleil Broussard. The coordination for the trip was made by Vera Petley, from Montreal. Shown in the attached photo are: Front row: Warren A. Perrin, Chairman of the Acadian Museum and CODOFIL Board Member, René Gareau, city councillor of Sainte-Marie-Salomé, Robert Perreault, mayor of Saint-Alexis paroisse, Pierre Beaulieu, mayor of Saint-Jacques de Montcalm, Kermit Bouillon, Lafayette Parish School Board member for District 5. Second row: Chef Pat Mould (who prepared a Cajun meal for one festival event on August 8), Stéphane Malenfant, director of Les fêtes gourmandes de Lanaudière, Serge Rivest, mayor of Saint-Liguori . Back row: Vera Petley, from Montreal, Annette Coutu, president of Conseil de développement bioalimentaire de Lanaudière, and Évangéline Richard, president of Festival acadien de la Nouvelle-Acadie.